As we all know, letting go of the past is not always easy especially when it comes to horrible experiences. For Tikka Malloy, the young schoolgirl in The Van Apfel Girls are Gone, it is particularly difficult given that when she was ‘eleven and one-sixth old,’ her three best friends vanished mysteriously. At a time when Australian publishing seems to be experiencing a golden age, here is yet another terrific Australian debut. 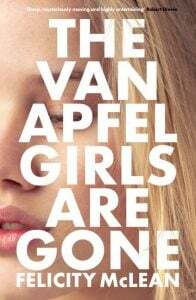 Part coming-of-age, part mystery, darkly comic with a very charming narrator, The Van Apfel Girls are Gone is instantly beguiling. The cleverly woven plot involving two families in the ‘burbs, unravels during the sweltering summer of 1992. It’s a time and place very well drawn, with its ice-blocks, chlorine scented bathers, the girls and their secrets, the parents hovering (not always benevolently), and the TV blaring in the background with the biggest story of the time, the Lindy Chamberlain ‘a dingo’s got my baby’ case. But beneath the suburban innocence, lurks a sinister underbelly. The narrator is Tikka herself, the kind of kid who could drive you to distraction. She’s a nosey parker, partly because as the younger sister she fears being left out. As the story swings between her childhood and the present with Tikka a young adult, her voice rings loud and clear. Hilarious, endearing, at times, spot on at others yet not old enough to understand all she’s seeing and hearing, Tikka is quite a character. Visiting from the US where she’s now working and staying with her older sister and her parents, Tikka has never been able to put the tragedy of her missing friends behind her. It’s a cleverly woven plot, the tension growing as the younger Tikka gradually reveals the events that led up to the three Van Apfel sisters running away during an outdoor school concert – or, were they taken? Tikka has her suspicions about a lot of what was going on back then, and her share of guilt – both she and her sister knew their friends were planning to run away from their crazy evangelical parents, but never mentioned it to police. These days she’s a bit doolally, but not so doolally that she doesn’t know the piece of grim information she held back all those years ago is significant, and might well have helped the police investigation. It turns out to be a bit of a theme, for she’s not alone in knowing more than she let on at the time. Many of her neighbours it seems, also believed in keeping themselves to themselves. Even when alarmed about things that they knew or suspected were going on behind closed doors, people were simply averse to calling in the authorities when they should have. As well as the creepy Van Apfel parents in whose house everything – including violent beatings – was God’s way, there was the sinister teacher Mr Avery always lurking around the girls, in particular, around 13-year-old Cordelia Van Apfel, the biggest rebel of the three sisters. While eyebrows are raised and alarm signals go off among the adults, again, no-one reported him to the authorities. These missed opportunities remind us that bad things happen when good people stay silent. On all levels, The Van Apfel Girls are Gone is an excellent read, gorgeously written, atmospheric and full of shrewd observations. Of course, like all good books, it does leave you wanting to know more. Will there be a sequel? We can only hope. Felicity McLean is a writer and a journalist. Her writing has appeared in The Good Weekend, the Daily Telegraph, the Herald Sun, the Big Issue and more. 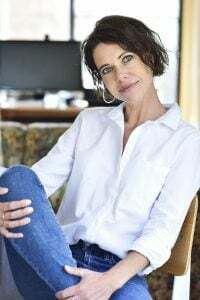 She has written fiction and non-fiction books and has been published by HarperCollins Publishers, Allen & Unwin and Black Inc. Her latest non-fiction book, Body Lengths, was co-written with Olympian Leisel Jones. It won the 2016 Australian Book Industry Awards ‘Reader’s Choice’ for Small Publisher Adult Book of the Year, and it was Apple iBook’s Best Biography of 2015. As a ghostwriter she has collaborated with celebrities, sports stars, business leaders and others. Felicity’s new fiction book, The Van Apfel Girls are Gone, is being described as Picnic at Hanging Rock for a new generation, a haunting coming-of-age story with a shimmering, unexplained mystery at its heart.